Compare cargo FCL Vs. ECONOMY LCL Sea freight from U.S.
Sizes of Sea Freight Containers | Stuffing Methods | Types of PU Locations | Reading FCL Ocean Freight Rate | Avoiding Mistakes with Sea Freight | S.O.C. Compare FCL Vs. ECONOMY LCL. Get INSTANT Freight Quote on shipping boxed or crated cargo from the USA. FCL is the abbreviation of "Full Container Load" that is commonly used in the international cargo transportation industry. In respect of cargo transportation from the USA by sea, FCL means an ocean freight service, which unlike LCL freight, grants rights to ship from USA cargo in entires multimodal sea freight containers: 20', 40', 40HC etc. Typically containers load and seal by shippers at the shippers' facility. Then containers transport within the USA by land to an ocean freight carrier's Container Yard (CY) where wait for the shipping from the USA to container yards at final destinations. Note that Container Yards of direct ocean freight carriers (called Steamship Lines - SSL) are not necessarily seaports. Container yards can be in landlocked countries and cities, as in the U.S. as well as in destination countries. Such container yards are connected with seaports by rail or truck lines. I.e. ocean freight may include inland trucking by SSL. Do not confuse SSL trucking, which is included in FCL ocean freight, with local trucking called Pre-carriage or On-carriage. Local trucking means transport containers from/to container yards. It is not included in ocean freight. Also note, that ports of departures and ports of arrivals are not necessarily in countries of origins and destinations. Containers can be transported from/to seaports of arrivals/departures to container yards in other countries by rail, tracks or local vessels (fiders). Finally, there could be a direct FCL shipping from the USA to your destination country OR shipping from the USA with trans-shipping via a hub-seaport somewhere on the way. Via Hong Kong, Singapore, Hamburg etc. NOTE: Even though you are shipping from the USA a cargo that sufficient to fill a 20-foot container (i.e. your total shipping volume is about 15 – 25 cubic meters), we still recommend you to consider options to ship it with our Economy LCL Sea Freight Service. In certain circumstances, you may find that shipping from USA LCL is more convenient and cost-effective than FCL shipping. You eliminate containers pre-carriage, waiting time, possible roll-over etc charges, which may be comparable or even higher than the cost of shipping sea freight itself. You may deliver light, easy to handle, loose cardboard shipping boxes and get it palletized at CFS. Then, beside of convenience, you transfer ISPM 15 compliance on the CFS. Upon arrival of your goods to the destination, you are not obligated on empty containers returns to ocean freight carrier's destination container yards. Find more about our ECONOMY LCL shipping from the USA in this link. However, if you transport from the USA a larger cargo that can fill the entire 40-foot containers, then shipping FCL can be the only effective option for transporting your goods overseas. Also, shipping cargo in multimodal sea freight containers should be safer, easily organized and more cost-effective compared with other services on shipping large cargo from the USA, such as Ro-Ro or Break-Bulk. 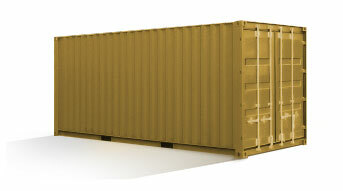 The only limitation is that your sizes and weight of shipping cargo must fit into 40' or 40' High Cube container. Note: There are other types of multimodal sea freight containers available. 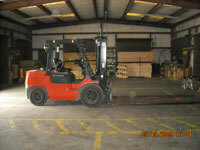 It is designed to ship from USA specific kinds of cargo and always subject to equipment availability. If you are a first-time international shipper and moving from the USA overseas, then do not confuse FCL cargo transportation with service offered by international moving companies. International moving companies will deliver a container to your door. Then they will load and secure your shopping goods inside the container. They should handle all formalities and shipping documentation with customs and carriers on your behalf. If agreed in advance, then international moving company will load a car and/other motor vehicles into the container. However, service offered by international moving companies is very expensive. Unlike with a moving company, if shipping household goods from the USA by regular FCL, then you are responsible to meet a container at a safe place and load and secure your goods in the container. Upon the empty container delivery, the driver will wait till you load and seal the container for one or two hours free. If you are not prepared to the load, then additional waiting time charges $50-$75+ per hour will be accumulated on each additional hour. Always be prepared to meet and load your container. Then your sealed container will be transported to a container yard and begin its international trip to the nominated destination. The supper is held responsible for providing complete shipping documentation to custom and carriers at the destination. As soon as your container will arrive in a container yard in the destination country, you (or your consignee/cargo recipient) held responsible to meet the container, complete destination country customs and pay all charges and fees related to release of the container. Then your consignee must arrange local transportation of the container, unload and return empty back to the container yard. All the shipping procedures may look complicated. However, if you are organized enough and keep control of your international shipping, then it should worth the money that would pay to an international moving company. Once again, if you can pack all your goods in shipping boxes, crates or pallets, then always consider the alternative to shipping cargo LCL. Shipping cargo from the USA by LCL is less complicated, more convenient and definitely more economical if you are shipping less than 10-15 cubic meters of the overall volume of your goods. *Payload weight exceeds over-the-road legal limits in US and Canada. Recommended maximum payload for shipping from USA and Canada is 35,000 lbs per 20' and 42,000 lbs per 40'. NOTE for shipping from USA household goods and personal effects with international moving companies: International moving companies will transport your goods in the same types of containers. Keep in mind capacity of containers above when considering which one will fit your shipping needs. A 'LIVE LOAD' - means that a trucker will deliver an empty container to your location and wait while you load, secure and seal your cargo. Freeloading time may vary from one to two hours. If you will exceed this free time limit, then you pay $50-75+ per hour for each additional hour. A 'DROP AND PICK' - means that a domestic trucking company will deliver and leave the empty container at your location for several days. Then they will return to pick up the loaded, secured and sealed container to the container yard for the shipping from the USA overseas. DROP AND PICK ON CONTAINERS DELIVERY MAY NOT BE AVAILABLE under certain circumstances and in certain areas. In respect of calculation of total shipping cost in your international shipping, the local container's transportation with 'drop and pick' typically costs twice as much as with 'live load' transport. However, 'drop and pick' has the advantage that international shipper takes a time on loading and securing commodity in containers. If you load a container near container yard, then the cost of 'drop and pick' transportation most likely will not be much higher than with 'live load'. Then added shipping cost might worth of taking time on loading and securing cargo. However, if you locate a good distance from the container yard, then the 'live load' might be the only option available to transport container from and to the container yard. 'IN A WAREHOUSE QUALITY LOADING' - (do not confuse with shipping with international moving companies) means that shipper self-delivers loose cargo to an international ocean freight shipping company's warehouse or to a dock of professional packing company, which specializes in a quality loading cargo into sea freight containers for the international shipping from the USA by sea. Once goods are received and accepted by the shipping warehouse, it will be loaded and secured in the ocean freight container by the warehouse on shipper's behalf for an additional cost. Then the sealed ocean freight container will be delivered it to the Container Yard (CY) assigned on your international shipment. The 'In a Warehouse Quality Loading' method is not always available. This shipping service can be costly. However, it could be less expensive than using an international moving company on entire shipping. Plus the professional quality loading company warehouse should guarantee the safety of cargo in the container during the international shipping from the USA overseas. If the quality loading company locates near container yard and has a permit to the container yard, then with this method you may save on shipping cost with local transportation part of your international shipping. Note: This topic is not intended to discuss packages of services offered by international moving companies on shipping household goods from the USA. 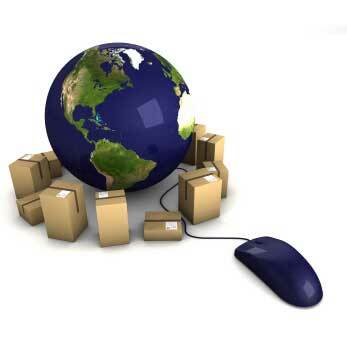 Information on shipping goods by international moving companies is widely available on the Web. ATTENTION TO CARS SHIPPERS! International shipping from USA cars and any other motor vehicles (such as shipping from USA motorcycles, boats on trailers, jets etc) in sea freight containers is the priority of quality loading warehouses. As soon as motor vehicles are delivered to the company's warehouse along with its original titles, the quality loading warehouse will pick up an empty sea freight container from a container yard and professionally load and secure vehicles in the container to the shipping from the USA. Keep in mind, ANY MOTOR VEHICLES CAN NOT BE APPROVED TO THE INTERNATIONAL SHIPPING FROM USA WITHOUT THE ORIGINAL TITLES VALIDATION BY U.S. CUSTOMS. Lack of validated title on just one vehicle loaded in the container will lead to delay or rejection of departure of the entire container. It also may result in a roll-over, storage etc charges and/or other penalties from Customs, seaport authorities, the international shipping company etc. Besides the quality loading of motor vehicles in the ocean freight container, as a rule, validation of titles with Customs is the job of quality loading warehouses. The international shipping warehouse staff should validate original titles of all shipping motor vehicles with U.S. Customs in order to obtain Customs release on the international shipping. Then validated (stamped) by Customs titles will be returned to the international shipper or (by request) mailed to the consignee. 'COMMERCIAL FACILITY' – means the pickup location (place of cargo load into an ocean freight container) provides a loading dock with a ramp and forklift. Shipper is responsible for loading and securing cargo in ocean freight containers delivered for the international shipment by international ocean freight shipping company's trucker (or arranged by a freight forwarder). When your loaded and sealed ocean freight container(s) leaves your facility, make sure that you have on hand a copy of dock receipt provided, signed and dated by the trucker of the international ocean freight shipping company that delivered this container, with the sea freight container and seal numbers in it. 'RESIDENTIAL LOCATION OR BUSINESS WITH LIMITED ACCESS' – SUBJECT TO AVAILABILITY. No ramp and forklift are available. Shipper loads an ocean freight container on his own. Shipper is held responsible for loading and securing cargo in sea freight containers. You may consider hiring a professional staffing company (an international or local moving company) in purpose to properly load your ocean freight container for the international shipping. If you are hiring an international or local moving company then remember to pay attention to the time slot for the sea freight container delivery confirmed by the international ocean freight shipping company (Freight Forwarder, NVOCC, VOCC) or its trucking company at a time of booking your international shipment. International shipping company and/or its trucking company CANNOT guarantee 100% this time slot on your ocean freight container delivery. Discuss that with your loaders - international or local moving company in advance. 'QUALITY WAREHOUSE LOADING' – SUBJECT TO AVAILABILITY. International shipper delivers pre-packed cargo to the nearest available international shipping company's warehouse (if available). Once your goods are received, a sea freight container will be delivered to the warehouse for the load. Shipping rate will include all applicable charges related to cargo receiving at the warehouse, storage (if any), loading and securing cargo in the sea freight container, titles validation (if you are shipping motor vehicle(s)) etc for your international ocean freight shipment. 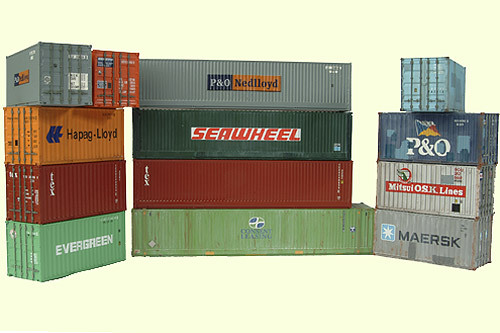 c. International sea freight shipments of 'shipper owned containers' (SOC) including above a. & b. requirements. With this 'ocean freight only' option international shippers are also entirely responsible for obtaining permits for access to piers or rail-yards of steamship line (SSL or direct international shipping company used on your ocean freight shipment). In the USA this generally requires a Uniform Intermodal Interchange and Facilities Access Agreement, or UIIA. Any roll-over charges that may appear during sea freight containers pulling and any other charges that may be added to the shipping cost of inland part of international shipment with this 'ocean freight only' option are on shippers account. Notice: For multimodal ocean freight containers rented by shippers from an SSL (direct international shipping company used on your ocean freight shipment), the shipper is responsible for the return of empty sea freight containers at the destination. When use service from an international moving company, discuss the empty sea freight container's return issue in advance. Most of the time FCL shipping quotes on transport cargo from the USA would be 'DOOR-PORT FOB vessel'or 'Free Out'. To be more specific - 'EXW (Ex Works) at named place of cargo pickup TO named destination seaport Container Yard, FOB (Free On Board) ship's rail at named port of origin'. The ocean freight. I.e. cost of international cargo transportation between origin and destination containers yards. Note that FCL shipping quotations typically DO NOT include any charges at destinations. Cost on local transportation to get the container "to door" to unload and return empty. Other applicable legal destination's charges, fee, and taxes (if any). * Rates DO NOT include import customs clearance fee, duties, taxes or marine cargo insurance. * Marine cargo insurance cost is 1.5% of cargo value subject to deductible of USD 1,000 per container; minimum premium USD 350 per sea freight container. * Maximum legal payload 18 metric tons per 20' & 20 metric tons per 40'; cargo must be evenly spread along sea freight container floor. * Containers must be returned "CLEAN AND ODOR FREE". Any container cleaning costs if any will be for the account of the shipper. A. Storage/demurrage charges at destinations on international FCL ocean freight shipping from the USA. In several days before your international FCL sea freight shipment will arrive in the destination, your consignee (recipient) should receive a notification on the cargo arrival. As a rule, it will be an arrival notice faxed or e-mailed to your consignee. Otherwise, it can be a phone call or mail. Make sure that contact information of consignee initially provided by you in a booking request is correct and valid. Act promptly! Your free storage time at a destination ocean freight carrier's container yard is limited. Depending on the destination, in international shipping FCL, it varies between 7 to 14 days. Thereafter storage/demurrage may increase the total shipping cost of your international shipping from the USA dramatically. By law, your consignee can work on the imported cargo recovery directly with destination county's customs and other parties related to your international ocean freight shipment. However, if the consignee is not familiar with import procedures in the international cargo transportation industry, then we suggest that your consignee immediately request professionals to complete the import cargo release on your behalf. It can be your destination's country customs broker or licensed freight forwarder. Forward the notice of arrival along with other documents required by destination authorities them. They will charge a reasonable fee for their service. However, they should obtain customs and warehouse releases on your international shipment with no (or minimum) storage/demurrage charges. When you book an international FCL ocean freight shipment and request container delivery for the load, then you "rent" the container from the steamship line that you use on the shipping from the USA. "Container's Rent" charges are included in international ocean freight rate. However, the shipper should always remember that after a container is released at the destination and left the Container Yard to be unloaded at consignee's facility, it must be returned empty and in good shape to the container yard within a certain time limit. Otherwise, container detention charges will apply. If your destination facility is far away from the container yard, then you should pay attention to possible charges on container detention. For example, upon your cargo release at the destination container yard, your container must continue to travel by rail thousands mile away from the container yard in bond or not. Then the empty container must be returned back to the container yard. In this situation, in order to avoid sea freight container detention charges and eliminate expenses related to the container return, the only option is using S.O.C. - Shipper Owned Containers, i.e. a "One Way" sea freight container. S.O.C. means that you buy a container on your cargo shipping from the USA at the origin. Then the sea freight container is your property and you are not obligated to the return. After it is emptied you may sell it, use for storage, destroy it etc. There are a lot of dealers around that can sell new and used multimodal sea freight containers for your international shipping from the USA overseas. IMPORTANT! STEAMSHIP LINES MAY NOT ACCEPT S.O.C. TO THE SHIPPING FROM USA WITHOUT CERTIFIED INSPECTION. Why do you need S.O.C? Consider a reload imported and released by customs cargo from your sea freight container to a trailer or in another container obtained at the destination. Does a rate obtained from an international shipping company effective for shipping S.O.C? Does your international ocean freight carrier require a sea freight container condition survey before the container is loaded? Consider a crane usage for lifting your ocean freight container on/from chassis or flatbed. Most container delivery trailers are designed to slide containers off to the ground & cannot handle the weight of a loaded sea freight containers. Do not overload a sea freight container. Consider road weight and ports cranes limitations. Do you have insurance of the type that will cover you in the event that ocean freight container failure damages the cargo of others or the vessel? Most likely your insurance will cover your cargo, but not the damage you do to others. Notice: S.O.C may send a negative message to Customs. Customs know that "Shipper Owned Containers" may mean a "one-way trip", it can often mean junk or even hazardous cargo and often purchased at the end of their service life. When transport cargo from the USA overseas, the shipper should clearly understand that he/she is held responsible for description and legality of commodity and sufficiency of shipping documents submitted to an international shipment. Carrier's ocean freight bill of lading, the final document that acts as a title for your shipped goods, as a rule, states 'SHIPPER'S LOAD AND COUNT' and 'SAID BY SHIPPER TO CONTAIN'. That means that the international ocean carrier (and a freight forwarder who represents this carrier) is not responsible for information provided by the shipper on his commodity. An international freight forwarder should guide shipper in the complexity of international shipment procedures. However, it is shipper's responsibility to provide all necessary international shipping documents related to his/her international shipment that will be required by origin and destination country officials. A. International Ocean freight Bill of Lading – Ocean Carrier's transport document. Shows cargo routing, consigner, consignee, cargo description, etc. The title on shipped goods. B.1. For commercial international ocean freight shipments - Commercial Invoice. A complete description of the commodity being shipped. B.2. For shipping household goods and personal belongings overseas – Valued Packing List. An inventory list with a value assigned to each item being shipped. Note: Some courtiers require proforma commercial invoices on shipping from USA household goods or personal effects as well. However, having a complete Valued Packing List submitted at the origin, upon destination customs request, make it easier to transfer your Valued Packing List in form of a proforma commercial invoice. D. Consider other International freight services on shipping cargo from the USA by the sea with our instant real-time ocean freight price calculator. 2. FCL ocean freight (Full Container Load): International Shipping of entire sea freight containers with Household Goods and Personal effects (No motor vehicles). See this related link. 3. Commercial FCL freight. IMPORTANT! : Shipping rates and procedures are different from international shipping of Household Goods and Personal effects. You must NOT use this pricing schedule on international shipping of Household Goods and Personal effects. See this related link. 4. International shipping of cars and other types of motor vehicles (small boats, motorcycles, jets etc) consolidated in multimodal ocean freight containers. See this related link. IMPORTANT NOTE ON INTERNATIONAL SHIPPING FROM USA A FOODSTUFF: Shipping of Food Stuffs including wine and drugs (any item that is edible), including food items, edible animal byproducts, supplements, etc, are subject to detailed regulations. Violations of these regulations can result in detention, confiscation, or destruction of cargo, as well as fines and criminal charges. Responsibility for proper documents, permits, and incurred charges are for the account of the shipper/consignee.